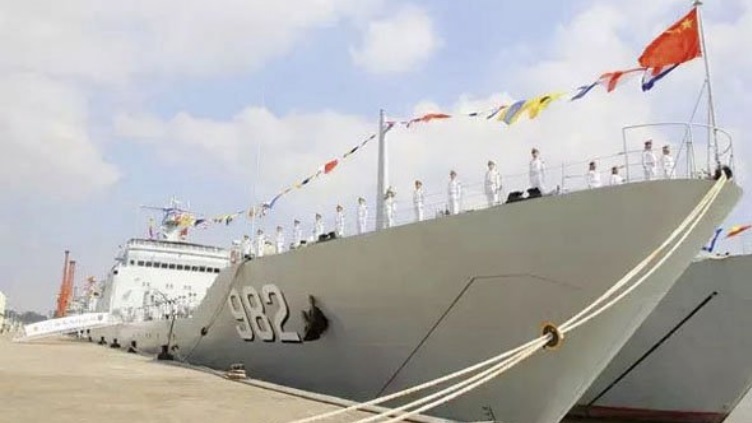 BEIJING, -- Chinese media has reported that the commissioning of a Type 072A Yuting II-class landing ship tank (LST) vessel, Taihanshan (982), took place on 21 October. The LST is the second to be commissioned this year. Dabieshan (981) was commissioned on 23 May. Nine other Type 072A LSTs are already in commission, although the most recent of these was completed in 2005. Internet sources suggest that an order for six more has been placed, with four to be built at the Wuchang shipyard in Wuhan, and two in Fujian. The first Type 072 LSTs were introduced in the late 1970s, and the class has been developed through four variants. The latest of these, the Type 072A, is 120 m long with a full load displacement around 4,800 tonnes. Equipped with bow doors and a stern ramp, the vehicle deck runs the full length of the ship, under the bridge superstructure, and is capable of embarking up to 10 armoured vehicles. A total of 250 marines can also be carried. The ship has a flight deck for helicopter operations, although no hangar is fitted. The latest two ships appear to be very similar to the previous Type 072A, although the twin 37 mm turret on the fo'c'sle has been replaced by a single-barrelled H/PJ-17 30 mm mounting, and a satellite communications aerial has been installed aft of the forward mast. Two cranes are positioned on the upper deck, forward of the bridge, to facilitate offloading equipment into boats alongside or a jetty. The commissioning of the PLAN's Type 072A Yuting II-class LST Taihanshan (982) took place on 21 October.